On Friday, the morning after my advance tour of the Michael Jackson exhibition, I set about trying to arrange another interview. The London Film Festival begins this week and I knew that a documentary was screening about Ralph Steadman. 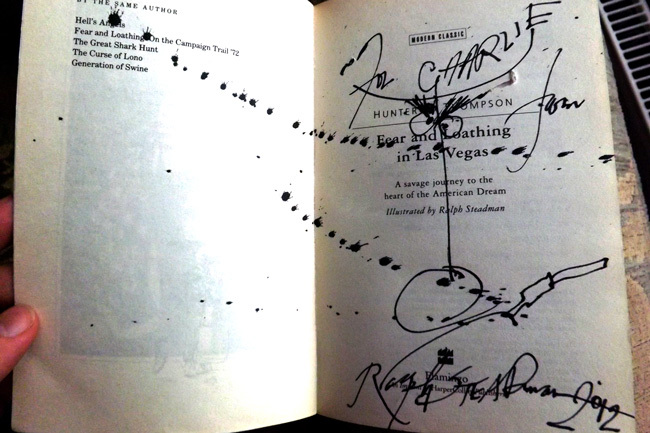 Mr Steadman is probably best known for his collaborations with Hunter S Thompson and I am a huge fan of their work together. I even wrote my university dissertation on Hunter's gonzo journalism and to what extent its influence could still be felt in contemporary journalism. While the pair's most famous collaboration is probably Fear and Loathing in Las Vegas, I have two favourites; one from the early years and one from the latter. The first was their debut, 'The Kentucky Derby Is Decadent and Depraved', written for short-lived magazine Scanlan's. The second is a giant coffee table book, 'The Curse of Lono', in which Hunter drags Ralph to Hawaii to observe a marathon, setting in motion a chain of catastrophic events. Knowing the Steadman documentary - 'For No Good Reason' - was screening at the film festival a week later, I called the press office on Friday morning to see whether Mr Steadman might be in town giving interviews at any point. 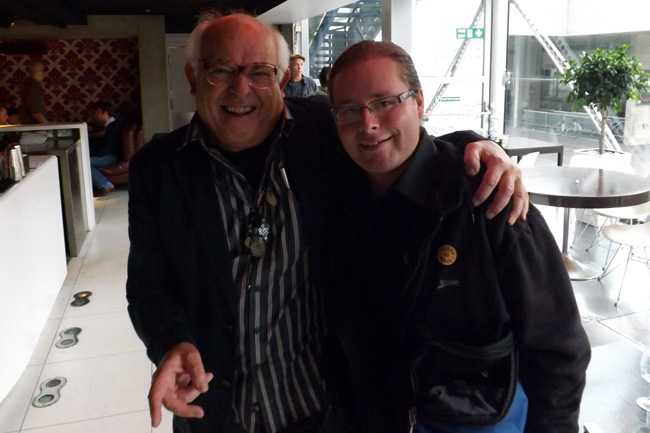 To my surprise, I was told Mr Steadman was at the BFI National Film Theatre at that very moment. At midday I received an email telling me I had been allocated a slot at 2pm. I had nothing with me - no dictaphone, no camera - so had to leg it home, gather my equipment and dash to the train station. I made it to the BFI with just ten minutes to spare but that didn't matter in the end. The gentleman before me was still waiting and we were told there was a backlog. As time wore on - and 2pm became 3pm - we were approached, variously, by PR workers, the film's executive producer and its director, all of whom explained that Ralph had a tendency to veer off on wild tangents and his interviews were all overrunning as a consequence. Eventually, Mr Steadman loomed over me, grinning maniacally and claiming I shouldn't ask him any questions because he was a 'moron'. It was a strange beginning to a strange interview, which should be published later this week. 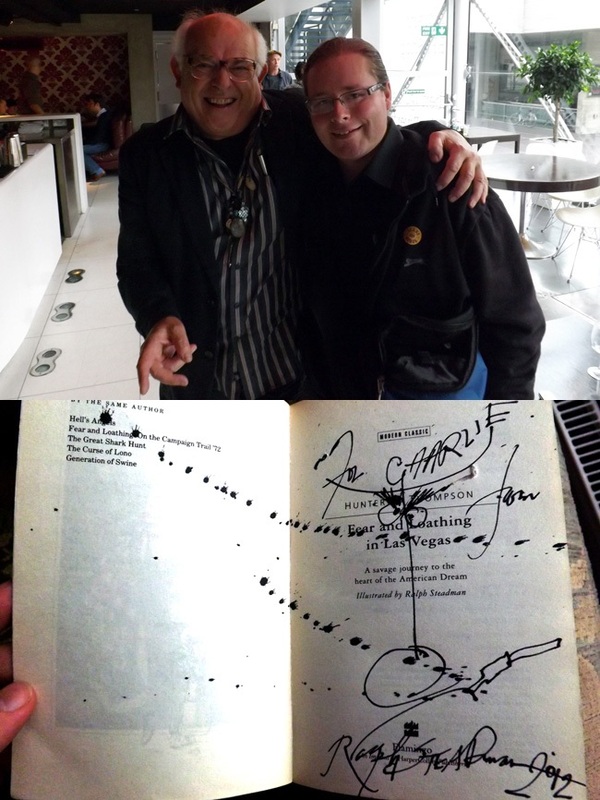 Before we parted ways, I asked Mr Steadman if he'd do me the honour of signing my copy of 'Fear and Loathing in Las Vegas' ('The Curse of Lono' wouldn't fit in my bag). 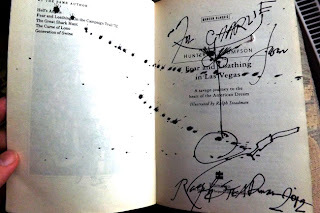 He went a step further, drawing Hunter's face - complete with cigarette holder - then raising his fountain pen above his head and flicking it downwards, splurting ink all over the book (and my dictaphone and the BFI's table). We had a few pictures taken and then I headed home. It was certainly not an encounter I'll forget in a hurry. As soon as the article is published, I will post it here.